Review: I chose between 3 DVDR's and mainly chose this one because I had no DVD Compatibility issues. One of the other recorders had to be unplugged when it licked up reading certain DVDs. I have not updated the firmware and am content thus far. Recorded DVD's play fine on any of my players. DVD+R's need to be stopped before they run out of space or htey don't close the session properly, but DVD+RW's you can hit record and let it run til it is out of space...the longest is around 6.5 hours. Most modes will record 10-30 minutes past their 1/2/3/4/6 hour specs. I wish this price range afforded for Component input and Decoded Dolby 5.1, and had a USB for cameras and storage devices, but for the price I am content. There is a contender out there (probably a *****) that I think would satisfy all the above in the same range, but I'll let you find it. I have it's little brother player (*****) and am quite happy with every aspect of its performance. 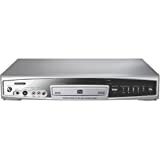 Review: I don't actually own this particular model but I do own a GoVideo R6740 DVD recorder. Here's the major thing potential customers interested in getting their first DVD recorder should be aware of (I bought one not knowing the following): the GoVideo units (as well as other lower-cost brands) only record on DVD+R/RW media, as opposed to DVD-R (notice the dash instead of the plus symbol). The DVD+R media will NOT play on any other machine besides the unit it was recorded on, even when finalized. However, the DVD+RW's (rewritables) will play on other machines but the unit is quite fussy about the brand of media you use, as I've had some problems with recording DVD+RW's giving me the "Write Fail" error message. The DVD-R/RW media is much more compatible with other players, so be forewarned. Otherwise, it's a fairly decent unit as a DVD player and as a recorder if you can live with the limitations I've mentioned. Review: Never mind that the thing broke down after 4 months and couldn't even read its own discs, because GoVideo support was nice about it and would have repaired or replaced it (I brought it back to the store for a refund instead). On the plus side? It does (when it was working) what it says it does, and the video is high-quality. The minus side? Huge. A user interface that looks like it was created by apes, for apes. Examples: You're watching a show, you decide you want to record it, so you put in a disc. From the moment you hit the "Open" button, the program you're watching disappears, and is replaced by the GoVideo logo screen, which cheerfully takes about a minute to figure out that you've just put a blank DVD into the machine, and give you back to a screen where you can go back to watching TV. That doesn't sound like a big deal unless it's the World Series you were watching. You can't let the machine record to the end of a disc, because that disc will become unreadable. If, at 11:05, you give it instructions to time-record from 11:00 to 12:00 (because you want to leave the house), it starts up, but records for a completely random period of time, and stops well before 12. My replacement is the LiteOn LVW-5005. Even cheaper than the GoVideo, and while I can't yet swear to its reliability, the software and the general usability is 10 times better. And I can do things like add chapter stops and give titles to my tracks, something the GoVideo interface wouldn't let me do! And I can record to the end of a disc, and leave the house with it recording! All in all, the LiteOn people seem to have expended far more effort in making this machine feel like a VCR replacement, and I think they succeeded. Oh, one more thing: the GoVideo had an annoying 60hz buzz on the audio coming from the RF (Tuner) input. I had to use the A/V input instead to get rid of it.